This travel trailer has all the amenities to make your camping trip convenient and fun at the same time. 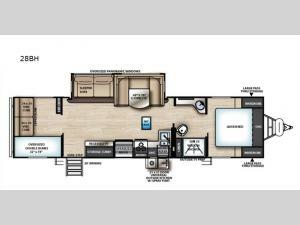 The kids will love being able to invite their friends with a private bunkhouse in this unit that includes oversized double bunks, and an upper bunk above two Vibe Cubes they can relax on with a book or their tablet. Open up the slide out to make the living area feel just like home. 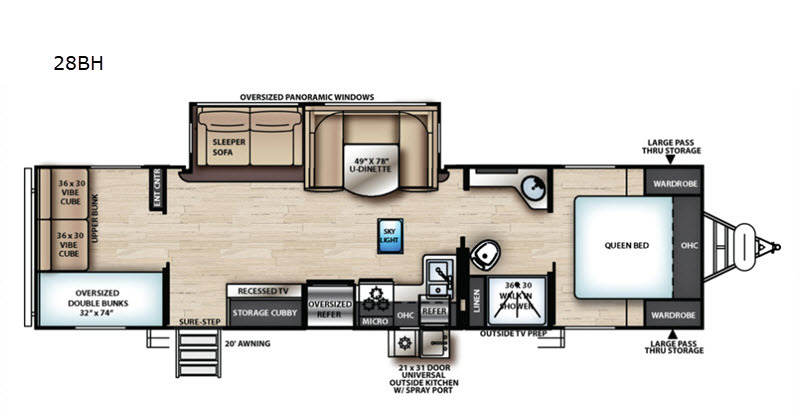 This model includes a sleeper sofa, a U-shaped dinette, and a queen bed in the front bedroom, allowing sleeping space for ten with the bunkhouse included. You'll love the walk-through bath with a shower skylight that gives more natural light. Also included in this travel trailer is a storage cubby inside for shoes or valuables, an outside kitchen, plus outside TV prep for the option of watching the game outdoors!